A couple of days ago I wrote about the benefits of dancing, and today I’m going to concentrate on the amazing benefits of music. To me music has the ability to literally change my perspective. I once listened to a song so deeply that I nearly astral projected! It enhances whatever experience I’m having, and allows me to create scenarios in my head that lets me integrate ideas with music and push my ideas to all kinds of boundaries. It can make me nostalgic or excited, happy or sad, and anything I want to be in that moment. Music also relaxes me. The other day I felt so stressed that I put on my new favourite band (Light & Motion – song below) and immediately felt my body physically relax. The music was feeding my soul. Music allows us to step outside of ourselves and appreciate the sounds of the universe. We have our feet in reality, illusion and dreams all at once. We’re transported from the mundane to the spectacular in one note. It has been known for some time now that music has healing properties and there are centres based around the world who support and help those with mental health issues through music therapy. It produces a sense of social cohesion and induces an altruistic effect. The studies carried out have shown that people started to become more proactive in helping others and in general felt more uplifted from their participation in music therapy. Part of the reason for this is that music helps the brain produce dopamine – a neurotransmitter that helps control the brain’s pleasure centre and emotional response system – thus giving us the feel-good factor. It has also been shown to have a positive effect on illnesses such as Parkinson’s. It can help sufferers to improve their balance and co-ordination, their social interactions become more positive, and it helps with their memory and attention processing. The 528Hz frequency is most commonly known as the “love frequency” and is often written down as the ‘528Hz love’. Some even call it the “miracle” note. It allows your spiritual essence to connect with heaven and earth and has even been said to heal DNA. It’s a tone that resonates deeply with our souls and through the vibrations it heals our bodies and our minds. It radiates peace, love and harmony throughout the universe. There’s a lot of fancy mathematics behind this number which I don’t really understand (numbers aren’t my strong point). If you do fancy looking at the maths behind it then here’s a good website to look on: Attuned Vibration. To be honest it is fairly simple to understand, but whenever my brain sees numbers it automatically shuts down and just says NOPE. You may or may not have heard of the Fibonacci sequence, but it’s basically a series of numbers that are the sum of the previous two numbers. It was discovered by a man called Leonardo Fibonacci and the sequence always start with 0 and 1, which equal 1. Then 1 plus 2 equals 3, then 2 plus 3 equals 5, etc (I’m sure you get the idea and don’t need any more of my amateur mathematics to explain it!) The numbers represent the Phi or “golden ratio” – which is 1.618 – and is often referred to as the “perfect or divine number” because it’s the number of beauty and visual satisfaction (think of Da Vinci’s ‘Vitruvian Man’). The amazing thing about these numbers – Phi – are the shape it makes: the spiral. 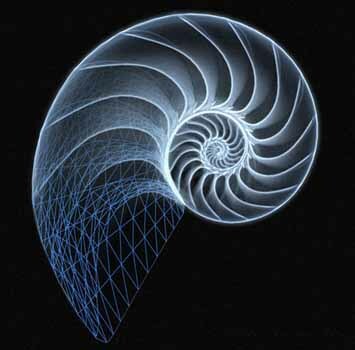 So next time you pick up a shell take a moment to appreciate the miracle and the beauty of the golden ratio. This sequence is also represented in other parts of nature – take a look at the petals on the flowers – they are perfectly spaced apart to be enticing and to stay alive. Or how about appreciating how perfectly the leaves are arranged on trees? When you look closely you’ll see that each leaf is actually a perfect distance from previous leaves to get enough light to grow. I used to think that leaves grew where they grew, but now I can appreciate how intelligent nature is and that nature knows exactly what she’s doing. So how does the Fibonacci sequence relate to the 528Hz love frequency? Well, firstly it relates to scared geometry which is the idea that certain shapes have spiritual and scared meaning behind them. 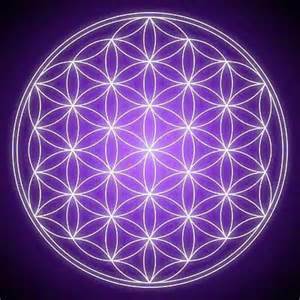 Sacred geometry has often been used to build religious and sacred buildings throughout history (think of the Pyramids in Egypt). Dr. Horowitz explains that “the basic structure of organic chemistry, the Carbon-6 hexagonal ring, reflects the sacred geometry of 528Hz frequency.” The number 528 itself resolves to a 6 (5 + 2 + 8 = 15, 1 + 5= 6 – using Pythagorean maths) which is the number that represents the heaven spiralling into earth, never ending wholeness and the physical representation of life. So this frequency is important to our existence – in fact it seems to BE the frequency of our existence here! According to one study carried out by John Hutchinson and his partner Nancy, the 528Hz frequency cleaned the polluted waters of the Gulf of Mexico after the BP oil spill. “The polluted area was treated with the frequencies for four hours the first day, and by the next morning, the waters were cleared. They also did four more hours of RF frequency to complete the test. The frequency device was situated about 25 feet up the beach from the water. If it could heal the Gulf of Mexico imagine what else it could heal! Why Does the 528Hz Frequency Affect Us? Quite simply, it’s the vibration of the music. As energetic beings who live in a world made of energy that vibrates at various levels, these vibrations affect us in different ways. Each one of us vibrates at a certain frequency and so it can be assumed that music can alter these frequencies. Remember those music frequency scale things that were on the front of old school stereos back in the day? They’d tell you the depth of bass, pitch, tone etc? Think of music having that kind of effect on you. Music of a 528Hz frequency is going to make your tone relaxed, your bass more grounded and your pitch much softer. 528Hz literally amplifies the positive within you, the music and the universe. Some musicians actually prefer to use the 528Hz frequency when they’re recording their songs. One of the most famous musicians to use this frequency is of course John Lennon. Apparently he recorded Imagine in 528Hz because he was aware of the positive vibes associated with it, and of course we all know John Lennon is all about love and good vibes! I think it’s amazing how vibrations and frequencies can subtly and completely affect us. Music strikes me as one of those things that has an unspeakable effect on people. It’s something that can only be felt. We can try and try to express how amazing a song or an epic piece of music makes us feel, but ultimately only we can know the expression through the feelings it evokes in us. Not only is music something the whole world has in common – to me it’s like a universal language everyone can understand – but it is a taste of the universe that is available to everyone. So to finish I ask that you put on your favourite song/album/piece of music and let yourself be completely taken over by it. Let it fill your entire being and vibrate in a frequency of love, peace and happiness. Below I’ve linked my new favourite song at the moment so feel free to take a listen and see how it makes you feel!